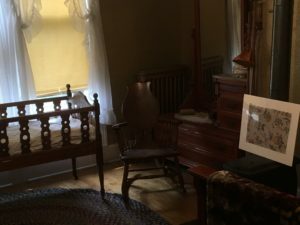 Travel Guide: Comstock Historical House! 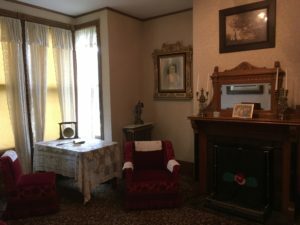 Renowned for their immense contributions to the development and education of the people of Moorhead, Minnesota, the 19th century home of Solomon and Sarah Comstock stands today as a historical center on the highest point of the city. 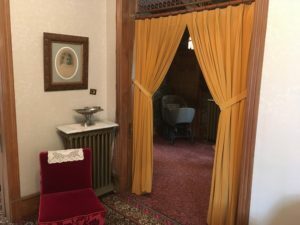 I toured the house one summer afternoon, and was amazed by the ornate construction and the lingering essence of the family which inhabited the home for nearly a century. 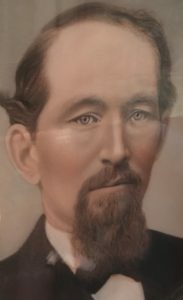 Solomon Comstock, originally from Maine, made his way west in the mid-1800s seeking his fortune as an attorney. After brief stints in Nebraska and Texas, he earned his way as a track-layer with the railroad, finally settling in the wild rail town of Moorhead. 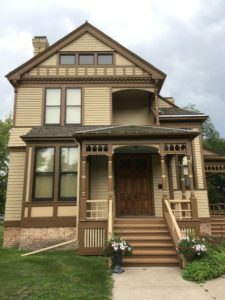 Through brilliant land-development deals and work as a lawyer and eventual politician, he quickly gained fabulous wealth and became something of a local philanthropist, finally building the two-story, eleven-room house in the new highland district which today remains as a historical center. The home was built in 1871 for his beloved wife Sarah and their three children, the youngest of whom, George, would be born in the upstairs nursery. 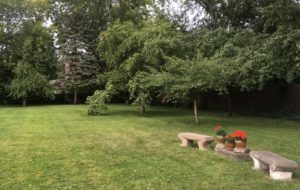 At a cost of $45,000 (about $1million in today’s money), the home was the most impressive and modern dwelling in all of Moorhead, and would be the site of many social events over the decades. It would eventually pass to George, who lived in the home until his untimely death from a heart attack in the 1960s. It was then converted into a historical center per instructions in his will. Upon entering the home, it is immediately obvious that no expenses were spared in its construction. Lavish wood work, carpet, wallpaper, and curtains adorn each room, especially the formal parlor, in which distinguished guests (politicians, businessmen, etc.) were received by the Comstocks, whose hospitality and social involvement were legendary. A portrait of the Comstocks’ eldest daughter Ada can be seen in the formal parlor. The fireplace mantle was carved from a single piece of Butternut wood. A portrait of young George Comstock, who would serve in World War I, hangs in the parlor. Travel Tip: Call ahead before visiting the Comstock House! 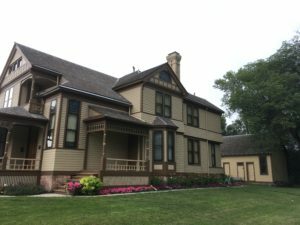 It is open for tours during the summer months on the weekends only, but it is possible to schedule appointments for mid-week tours. Admission is $6 for adults (credit cards are accepted), although senior and military discounts are offered. Call 218-291-4211 for tours. 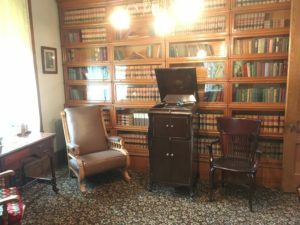 Next to the formal parlor, Solomon kept a private office to receive clients while working as a lawyer. He was well-known for his avid reading, and so his office became something of a library over time. A Victrola, given as a birthday gift from Ada in 1913, rests in the office. Solomon loved classical music. 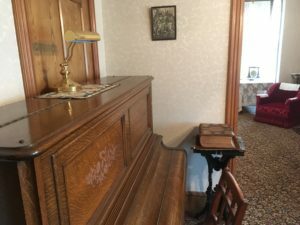 Solomon’s office also contains a piano given as a gift from Jessie (his second daughter), and a family Bible which he gave to his wife Sarah as a wedding gift. 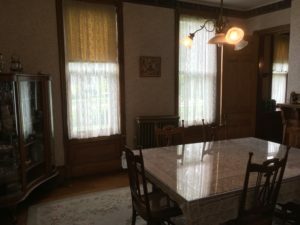 The dinning room of the Comstock House was a center not only of family gatherings, but also of social involvement. 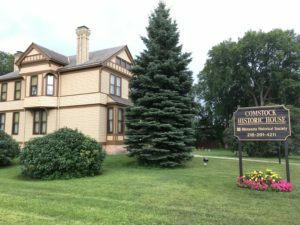 Here Sarah Comstock received lady friends for tea and eventually formed a board which established the first library in Moorhead after raising $3,000 and convincing Andrew Carnegie to donate another $12,000. It was a major accomplishment indeed for Sarah, who served as the board president. 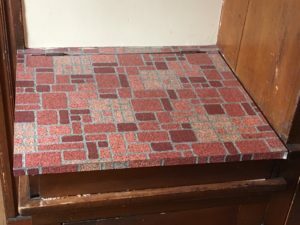 The original table, which can expand to seat 14. 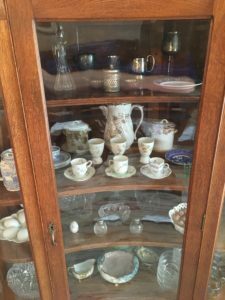 The Comstocks collected dishes and tea sets for their social entertainment. Next to the dinning room hides a small butler’s room where preparations for tea could be made and dishes received. 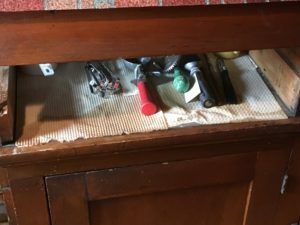 The counter holds a particularly modern secret as it doubled as a work-space and storage area! Just beyond the butler’s room stands the kitchen. Here the Comstocks’ maids (generally 14 or 15 year-old Norwegian girls) would prepare meals five days a week, with Wednesdays and Sundays off. 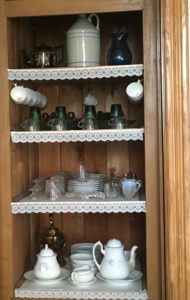 On Wednesdays, the Comstock family would make do with left-overs, while every Sunday Sarah would prepare her famous pancakes for a traditional 1pm meal. 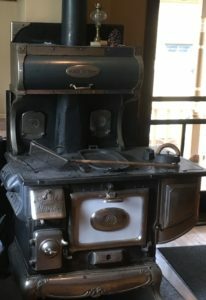 She was known for insisting that her pancakes be precisely 4″ in circumference, and be flipped only once while on the stove. An ice house stood just outside the kitchen, with ice delivered monthly from the Detroit-Fargo Ice Company. 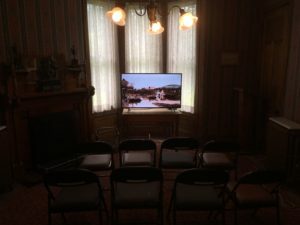 A traditional Victorian drawing room rounds out the first floor, now used for viewing a video presentation on the Comstock family. 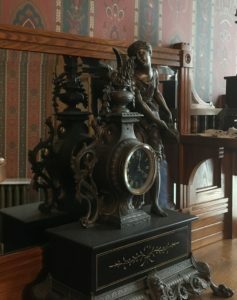 Of particular note is a mantle piece clock from France which Solomon gave to his wife on their 23rd wedding anniversary. 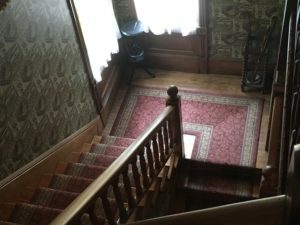 The top floor of the house can be reached by way of an elegant stairway, the banisters of which still bare the grooves scratched into them by the buttons on young George’s pants when he’d slide down them as a child. Upstairs the family kept their rooms, such as the nursery were George was born. Sarah kept a bed in the nursery to care for the children should they cry in the night. 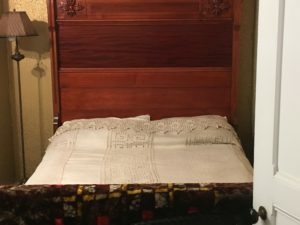 In typical Victorian fashion, the bed was designed for sleeping in a reclined, upright position. Next to the nursery was the master bedroom, with its lavish bed. 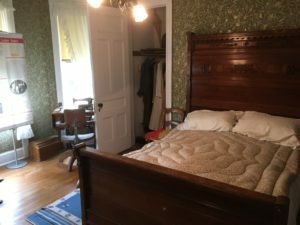 The bedrooms for Ada, Jessie, and the maids are also upstairs, with Jessie’s room doubling as Sarah’s after the passing of Solomon in 1933. 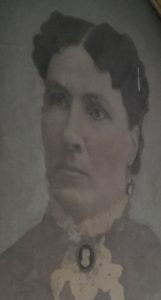 Ada, the most accomplished of the Comstock children, would become an educator and college president, eventually marrying a childhood acquaintance at age 63. Jessie, in addition to traveling internationally, would share the home with her partner Lulu for ten years before moving to New England. After returning from World War I, George and his wife were the final residents of the family home. 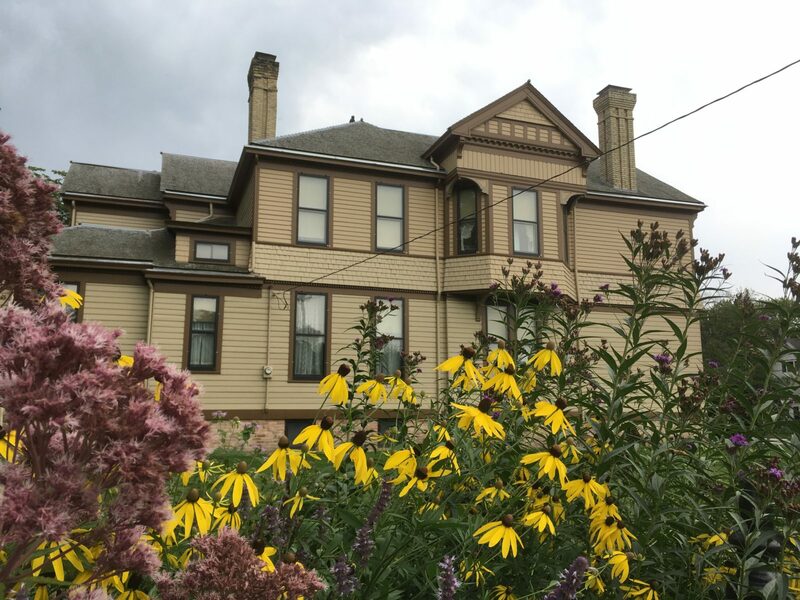 The lovely garden of the Comstock House stands as a mere reflection of its once opulent size, as it originally encompassed the entire city block and contained a carriage house and servants’ quarters. The Comstocks in many ways built the modern city of Moorhead through tireless social work and development. Many of the schools, the library, and even the grounds for today’s Minnesota State University Moorhead campus stand as a direct legacy of the Comstocks and their love for this city on the banks of the Red River. If you go, you’ll find the house at 506 8th Street South in Moorhead. Parking can be tricky, but I found a curbside spot just around the corner. Visit mnhs.org/comstock for more information. The Comstocks built their home as a statement of their wealth and influence. Do you think their legacy reflects their philanthropy or their vanity more? The house features many Asian and Victorian designs popular when it was constructed. Which designs would be obvious in one of today’s homes should it be a museum 100 years from now? Add your thoughts to the conversation below! ← Prairie Postcard: Salem Sue! You make this place sound so inviting! I almost want to move in! !